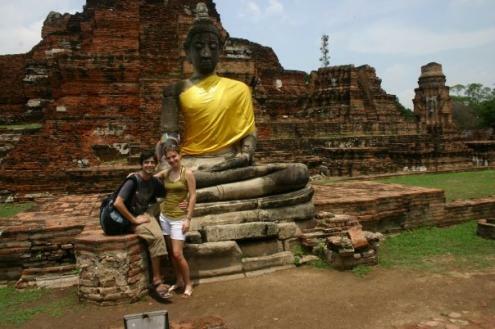 We've now departed Bangkok and took a bus a little further north to a small town called Ayuthaya. It was once the former capital of Thailand in ancient times and now contains many beautiful ruins of temples and palaces. On our first day there was a massive storm which limited what we could do but today has been much brighter. We've seen a number of sights including a Buddha head tangled almost beyond belief in the roots of a Bodhi Tree and row upon row saffron clad Buddha statues. The ruins are beutiful and silently unsettling in places. There's so much to see here but tomorrow we're heading further north to Lopburi. Lopburi apparently owes much of its fame to a gang of monkeys that have taken the place over. Lisa has been there before but I want to see it now. After that we will strike to the far north and places like Chiang Mai but we will keep you all posted.